Melissa from Melly Sews (also an Austinite, yay!) asked me to participate in this year’s 30 Days of Sundresses. It’s a whole month packed with cute tutorials for women’s and girls sundresses to start off your summer. For my tutorial I hacked a simple dress pattern and added a center panel of pintucks in the front along with some little waist ties to help give the dress some shape. I think it turned out pretty cute! And I’ve always wanted to have a reason to sew pintucks on something. It adds some extra interest to an otherwise plain dress. The fabric is a Valorie Wells cotton voile I’ve had in my stash for ages (yay stashbusting!). The pintuck sewing can be time consuming but the rest of the dress is easy. A woven tank style dress/shirt pattern, preferably without closures. A dartless design or one with side darts works best. A good pattern to start with might be Sew Caroline’s Tank Dress or even lengthening Grainline’s tiny pocket tank. I modified this Cynthia Rowley Simplicity pattern (it had gathering at the neck so I took out the excess width in front). The width of your pintuck panel (mine’s 6in wide). Add seam allowances on either side. The length the pintucks will extend. I made mine end about hip level, the loose fabric gives the bottom of the dress a little flare. The width of your tucks. I went with 1/4in. Your waistline point on the pattern pieces (to add the ties) and your waist measurement (to know how long to make your ties). And the length of the inner seam line on the front piece (the length of your tuck panel). Your dress pattern probably has just two main pieces – front and back. We’ll only be altering the front piece. Start by tracing a copy of your front pattern piece. Measure in from the center front half the width of your tuck panel (or 3″ in for a 6″ wide panel) and draw a vertical line top to hem. This is your new seam line. Then add your seam allowance out from that line and cut along the new line. Now you have your new front pattern piece complete with seam allowances! I recommend sewing the tucks right into the fabric and then cutting out the panel piece after you’re finished. It’s easier to sew a big batch of tucks because you don’t have to worry about being exactly precise with your tuck measurements and you can cut out your panel once you’ve sewn the width you want. Figuring out how many tucks you need takes a bit of math. I wanted 1/4″ tucks with 1/4″ space between them so counting both sides of a tuck it’s 1/2″ plus 1/4″ of space so 3/4″ (or 3x the width of a tuck for one tuck and a space). So for a 6″ wide panel you’d end up with about 18 tucks (3 x 6 = 18). Mine has 16 because I just eye-balled my tuck sewing so the space between each tuck is a little wide. Sewing the tucks is pretty simple. Begin by cutting a straight line across the top of your fabric perpendicular to the selvage. This will be the top of the panel. Then mark with chalk or a marker another perpendicular line at the bottom of the length of your tucks. This will be the the stopping point for the tucks, but not the bottom of the panel. Then draw a third perpendicular line marking the bottom of the panel piece (don’t forget hem allowance!). Cut along this line. Start at one side and work your way across. 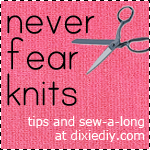 Be sure to give yourself a few inches off to the side to allow for seam allowances and wiggle room. Fold the fabric vertically along the grainline and press. Stitch 1/4″ away from the fold, back stitching at your end point. Yay first tuck is sewn! Next use your ruler to fold the fabric vertically 1/2″ away from the previous stitching line. Press and sew 1/4″ from the fold. Now you have two tucks with a 1/4″ space between them. Repeat until you have enough tucks to fill your panel width. With chalk or a marker draw your seam allowance on either side of the outer tucks and cut out your panel piece. To make ties long enough to wrap around and tie in the front I cut two lengths of bias tape from my fabric that are 1.5 x my waist measurement. One inch wide bias strips will result in 1/4″ wide ties. Colette has a great tutorial on cutting continuous bias tape. Once you cut out the tape fold and press it in half lengthwise then fold each raw edge inside and stitch the tape closed. You can alternatively just buy pre-made double fold bias tape and stitch it together. You can finish the bottom end of the ties by tucking the ends in and stitching them down or you could tie a little knot at the or even add a big bead to the bottom. Pin one of the ties to the waistline mark on the inner seam of the new front piece, right sides together, baste.Then pin the edge of the panel piece to the edge of the inner seam of the new front piece, right sides together and stitch. Repeat for the other side of the panel. From there you can assemble the dress like normal – sew the side seams and shoulder seams, finish seam allowances, add bindings or facings to neck and armholes, and hem. If you find the front of the dress is gaping, just take out the excess from the front pieces along the panel seam line. Give it all a final press and when you wear the dress wrap the ties around your waist and make a little bow in front! Thanks to Melissa for hosting this fun event! Now head over to Melly Sews to see all the other dress tutorials (I’m almost the last blogger for this month so you’ve got 28 more inspiring dresses you can peruse). And you can even enter to win a giveaway from Funny Fabrics!